First of all, if you don't get the title of this post, go HERE immediately to watch the video. Seriously, that video is one million times more interesting that anything I will ever write. Go watch it - it has over 100 million views for a reason. Awww, you came back? Sweet. Where was I? Oh, right. Are blogging buddies real life friends? Invisible friends and statues. Just elect me prom queen already, I am obviously insanely popular. In reality, hubby and I have met some great people. There are a few couples we hang out with and some pretty awesome neighbors that we are lucky enough to know really well. I have also met a few people through running/racing, although I wouldn't consider myself terribly close to any of them. So I wonder sometimes - does my obsession healthy enjoyment of blogging interfere with making, well...real life friends? I truly feel lucky to have met so many awesome people through blogging. There are super speed racers who inspire me to push myself, hilarious women who make me laugh even after a terrible workout and crazy good chefs who embarrass me into cooking actual meals instead of eating cereal three times a day. But at the end of the day (sorry for the overused cliche) it means I spend more time online, and less time with real people. But the truth is that 99% of the people who I connect with through blogging I will never, ever meet. Fine, I may run into a few at a race or even while traveling, but those brief meetings can't replace daily phone calls, weekend drinks and hangouts - can they? So here is my question for you all - do you consider other bloggers/readers/online buddies real "friends"? I guess I do. In the last few months I feel like I have really made a greater connection with some readers/bloggers through reading about their lives, sending emails, texts and even snail mail. Where do you know most of your friends from - work, school, childhood, spouse? At the risk of sounding like that girl in the corner, I really do struggle with meeting new people. Tomorrow I am meeting up with some people I've never met to run 13 miles in a new place - and I'm insanely nervous. I feel like if I put it up on here, I won't chicken out tomorrow morning. Wish me luck! I don't consider every blogger I read or who reads me my friend. But, there's a small handful of bloggers with whom I exchange emails, and interact with on a level that elevate them above "fellow blogger." I've met a handful of bloggers. Some of whom I never spoke with again. Some of whom I "talk" to all the time. Most of my friends I know because of the internet. Oh, god, my IRL friends all came from reading one dude on livejournal, going to some play with him, meeting his friends, and then befriending them (on LJ and IRL). Most of us have jumped the LJ ship, but we're all normal friends now. I have zero idea how people make friends without the help of the internet. Most of my real life friends I met through school or work. Even work friends I don't regularly call up and talk. Lots of texting though! I don't have a ton of in life friends but I am mostly to blame for that. I don't put up with a lot and at the same time I expect a lot out of others. Basically I expect to be treated in the way I would treat others. I hold myself to a high standard so I hold others the same way. It's not exactly a good personality trait but I'm a Capricorn and I can't seem to help it! I have gotten close to very few bloggers. I have regular comments from some and I love that. I don't know if I'll meet many of them. Some I know I'm destined to meet since we live near eachother and will end up doing the same races at times but otherwise I'm not sure! I would totally be down for a blogger meet up that wasn't too far from me. I do tend to consider some people whose blogs I read and who read and comment on my blog to be my friends. I have been online in communities since 1999 and have met many friends. Most real life friends are from high school or work. It isn't easy to meet people, I'm not extremely outgoing, so blogging and meeting my "imaginary" friends work for me. 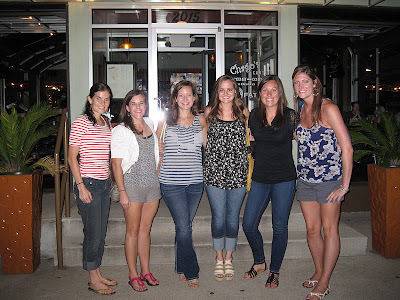 I hope to meet some of my bloggy friends in person, at races, etc. I've shared so many of your sentiments as well. I felt like my "virtual life" was cooler than my real life haha. The way I look at it is the relationships we make through blogging can ENHANCE our existing life. Take for example Jill H- she joined my work Ragnar team... or Ashley R, she will be on my bourbon chase team in september.... and OBVIOUSLY let's not forget Colorado Ragnar. So occassionally you'll cross paths with people, and some you won't, regardless I'm still learning so much from everyone. There are probably about five people I've met through blogging who I'd consider friends. Some I've met (you!) and some I haven't. It just depends on how often we talk- I don't NEED to have met them in real life to consider them a friend. I've met most of my "recent" friends through work, my husband, and running. It's so much tougher to "make friends" when you're an adult and not jammed with tons of your peers in school everyday. Good thing I work with a bunch of cool 20somethings. I definitely consider my blog friends my friends. I wouldn't say that I'm friends with all of my readers, but there are some that I talk to now more than my "real life" friends. acquaintances can turn into friends and vice versa. . . How is being a blogger friend different than a pen pal? Some blogs I read I love more than others. Yours, of course, falls into the first category. I love reading your blog. I use to belong to a chat board, which was closed down late last year due to MSN deeming it 'obsolete'. One got to know others on there, form friends within the board with similar interests/backgrounds or wish for finding out new things about someone who lives in a different country or with a different background. I have friends who come and go through life and I have a few friends who remain constant, even though we only chat every few months. I consider some of my blogging friends "friends" instead of just bloggers. I moved to this town some 3 years ago. It is a small town and with it, small town gossip is quite the usual. I tend to stay away from it, and enjoy staying home by myself, and indulge in my blogging friends. I actually am more open to you guys on my blog than I am with actual friends here. That being said, I have became friends with 3 co-workers out of like 60 of them. It was 4 but, I realized one of them was a little crazy and had to scale down a little. My closer friends are from college and from the newspaper I used to work with. They live about 3 hours away from me, so I don't get to see them often. shucks, I thought you were going to post about how you got all drugged up at the dentist! I don't have a TON of 'real life' friends, I've always felt more comfortable with a few close friends rather than a big group. I am still perfectly happy to hang out in a group if the occasion calls for it though. My closest friends now are from a job I worked at a few years ago - we are still super close even though I moved 2.5 hours away. I have a few school friends I see when I travel to my hometown and my newest friends are my neighors, who are awesome too. I have met a few bloggers and consider them friends. A few I haven't met yet are super cool and we communicate often so I would consider them friends as well. I don't think there is anything wrong with it, I mean people date and then marry people via the internet, so why can't you make a few friends that way too? I LOVE that video, it is hilarious! I consider some bloggers that I interact with as potentials for being friends and others as people I interact with on the internet. I think we all have a connection because of our passion for running, training, triathlons, etc. but some of us just wouldn't click in real life. Most of my friends are through my work/school (we all went to school together and now work at the same place) but sadly my husband and I have been excluded from a lot of things lately. I guess our friends think we are "too busy" running and training. Their loss! I've only met a couple in real life. Some people I definitely feel a little bit of a friendship with from interacting with online all the time but no one I'd consider close in any way. In general I don't really get really close with too many people though, most of the people I interact with are people through work and some through running. Have a blast tomorrow and good luck! I am always nervous to run with new people but in the past year I have met some of my closest friends that way. What Steph said in her comment really struck me and I agree...I don't think a friend always has to be one you have met to be considered a friend. I have shared almost as much if not more sometimes with some of my closest blog friends that I have met only once or not at all! I really enjoy reading blogs but will probably not meet any of the bloggers I follow but never say never there are always meet-ups or races that may create opportunities. Unfortunately I haven't met anyone from blogging outside the computers. I do have real life friends who have become bloggers, but I don't consider them "blogging friends" if that makes sense. I think it doesn't matter how you meet people or in what venue you use for communication. If you're happy and you are satisfied with the social interactions you have then it's all good. I hope you have fun tomorrow! I love long-run buddies! I meet most of my friends through church, and I also met some at the gym when I had a membership. I think I consider the blogs I read my "blogging friends" but if I met them in real life I would consider them my friends. I think of some bloggers as friends, especially the ones I've actually met! But you will never ever catch me starting a blog post with "Hello friends!" This is a really interesting post! While I haven't met the majority of bloggers I "know" on the Interwebz, I do consider some of them to be friends, at least to an extent. Really, they know about as much of me as my IRL friends do, and I love sharing a bond and connection with them through writing. As for the ones I have met - they have become some of my best friends. I think blogging made that possible because we were able to seek each other out based on shared interests rather than meeting randomly and maybe never speaking at all! 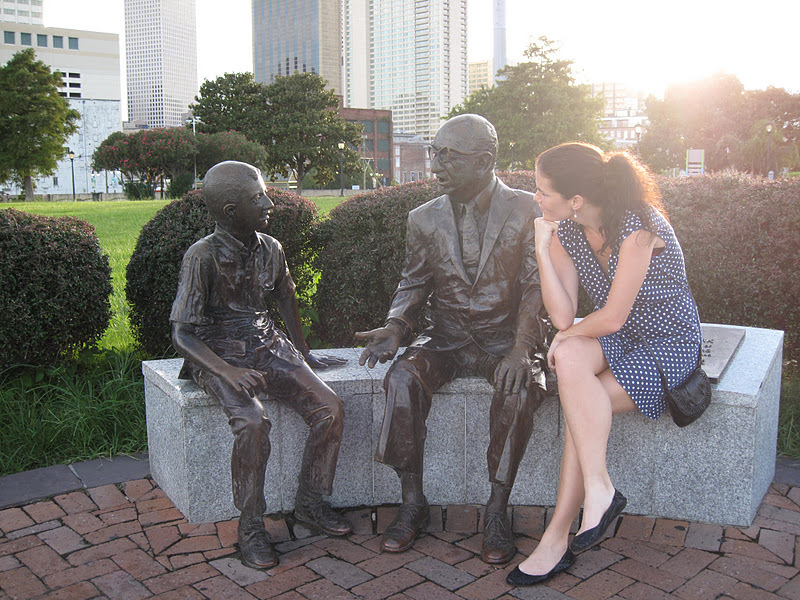 My husband calls my blog friends my "invisible friends". It's totally true! I think they are real friends- some blog buddies are more like acquaintances, but some I feel are real, true friends. When you think about it, we bloggers probably know more about you than a lot of the people that are involved in your day to day life. I will say that I definitely feel a stronger connection to the bloggers that I have met than to the bloggers that I haven't. I think online relationships are real b/c you get to find out more about a person than maybe you would in person. I also don't have many real life friends. It's hard to make them when you're older. I have made some acquaintances but no bestest bud phone calls for me either. Hugs friend who is in the corner - you'll be great tomorrow. You'll have a blast - remember how much fun your last group run (or at least I remember reading about your first group run a little while ago which turned out to be great!). I think running really brings people together - and I think it's a great way to meet new friends. As far as bloggers becoming "real" friends - I would say that they are real friends but those that you have never met or never communicate with outside of blogs (i.e. email or facebook or texting or whatever) then have a special category. I, though, really like my blogger friends and make attempts to meet them (not in a stalker kind of I'm a serial killer kind of way) - but I arranged to meet Mommaof3ontherun when I was in FL and to meet Runnersluck when I was in OH and I've met TrainwithLisa at the half. Kimberly from HealthyStrides has become a real life friend whom I do things with like body pump and boot camp and girl dates as a result of her blog. I think blogging and running fit perfectly together and are great door openers for friends. I'm hoping our paths cross one day . . . so I'll figure out a race in GA and we'll meet (unless you don't want to- ha!). I hope to go to the Long Island Diva Dash in the future and Meet Biggergirlscanruntoo and hope to meet others as well. I hope you have a great time tomorrow! I agree with most of the comments I have read here. Some bloggers you just feel more toward. But if you were avoiding IRL relationships to be online, then I would think there was cause for concern. I don't guess I would consider anyone I've met through blogging a "friend" ... more like "acquaintance" I guess. There are lots that I think I COULD and WOULD be friends with if we were around each other though. I've met a small handful of bloggers in real life, and while we had a great time and are now Facebook friends (haha) the communication stops there. Blogger and Facebook. I'm hard-pressed to call anyone "friend" unless there's some sort of personal exchange going on. I totally understand what you mean about meeting people. We moved around a lot growing up, and most of my college class dispersed after graduation. I manage a pharmacy with ONE, count 'em ONE, other employee, and our church is far enough away to make social activities inconvenient. Turns out it just takes awhile! I've met friends at a small group Bible study, a running group, neighbors, and at work - customers! My problem now is that I'm 29 and childless and man, that's a hard demographic to find. All my peers are family people and have no interest in staying up until midnight reading Sherlock Holmes aloud and having brandy and water. I feel ya! I totally struggle with meeting new people, although I am social and love being with others. A lot of my friends have moved away in the past few years (post-college), while I took a job just outside my home town. This means that while I have a lot of friends, I have only a handful of friends I actually see. I think I am just too lazy to put in the effort to find more friends! I know what you mean... part of why I started blogging was to connect to other runners, as I have very few in 'real life' who get that side of me. :) I'm looking forward to meeting some bloggers in Houston next week, to make that deeper connection. And good for you for putting yourself out there with a new running group! Right now I'm just having trouble getting people to read my blog! I'm in need of some advice! I think I naiively thought that blogging would end up introducing me to new people. Ever since I graduated college and all my friends went back to their hometowns, its been hard for me to meet people. My fiance and I have some friends of his from high school that are still around the area but we do have trouble meeting new people outside of work and family. I'm way too new to the blogging game to answer this question. I think it would be fun to meet up for some runs with other bloggers but I'm definitely not there yet. I have come to think of many of my blog friends as friends and I hope someday to get to meet some of them in real life. When you follow someones story and they follow yours you start to feel like friends. You care about them and are excited when they do well. Have fun on the run! i've made some great friends through the blog that live both near and far that i talk to on a regular basis, but the friendship sadly was never initiated by me. passing out my phone number to peeps that i've met online always gives me weird feelings, but so far it has turned out okay. the hubby and i have met a lot of great people through our church, but meeting new people is something that i'm never comfortable with. basically the hubby finds most of our friends. yes I do consider some bloggers my friends. not all of them of course. The ones that I am friends with I have not even met!!! 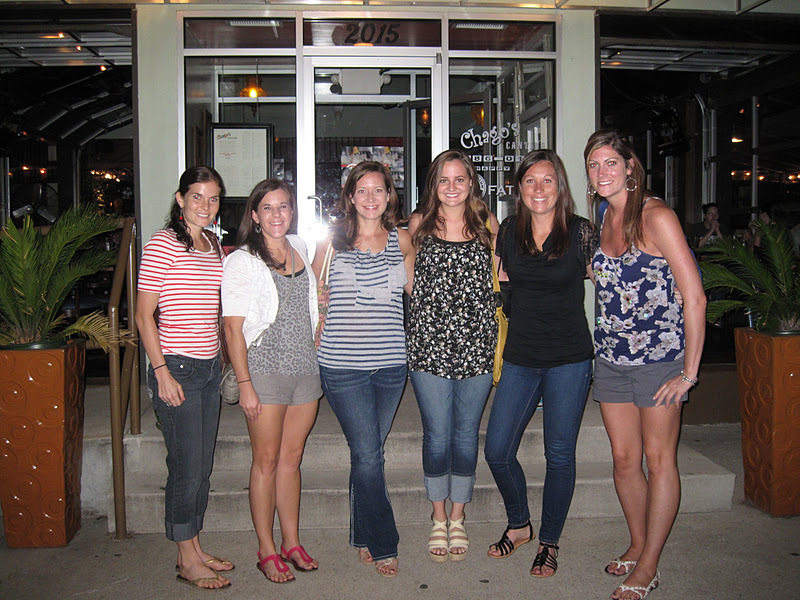 I have met some other runners thru blogging that I now call friends. Some I haven't met in real life but would still consider friends and know if we ever did meet we would be, well at least I like to think that you never know they may not feel the same haha. I live now where I grew up so most of my friends are childhood friends and I also have my co worker friends. When I lived in WA (moved last feb) it was hard for me to make friends and my fiance was deployed at the time so it was even harder. Luckily his family is there and I became close with his sister in law and also my coworkers there. Aw, I really feel for you in this post - when I first moved to MD, other than the two friends I moved with, I knew no one, and I felt it was SO hard to make new friends. I honestly didn't feel like I had really overcame that until a few years living here (and, of course, meeting my husband in that time helped!) Meeting people is hard enough, finding people you actually click with is even harder. I'm lucky enough to have retained a few close friends from high school, college, and my former jobs. Most of my friends that I've met here have been through work or running. I consider some of my fellow bloggers friends - particularly the ones I've met in real life! I think that it's easier to find those people you click with when you read about their lives every day, and then the internet and smartphones make it so easy to connect! It's two sided though - I have to make a conscious effort to put away the phone while I'm out with people - it's not fair to be tweeting and emailing your blog friends while ignoring your real life friends! It can be hard to balance. Wow that was a long comment....hope at least some of it makes sense. Your post really got me thinking! thank u for this post!!! gosh, i often feel like such a dork because i've moved around and often think, "umm, okay where do i go to meet friends?" i mean how lame does it sound to go up to someone randomly at the store, "hi, wanna be my friend?" i'm pretty sure i'd wind up on to catch a predator or something! haha. I have so many blog FRIENDS! And yes, I call them friends because that is exactly what they are! Some of the people who I have NEVER met are so supportive, even more supportive than "real" friends. YOU, for example, are more than just a "fellow blogger" to me. There are quite a few others that I just feel really close with and I don't think the fact that we've never met changes and of that! I literally talk to my real life people about my blogging "friends" and speak as if they were someone I might have hung out with the night before. It is sort of like long distant dating..just because they aren't right there in front of you does not mean that you don't have a relationship. I full believe in making friends in the blog world. Also, blogging friends are almost better friends because they see your vulnerable side and see you at your worst. Most people share more on their blog than they would in real life so blogging friends get to know the real and true you. NO shame in blog friends! I think that there are a handful of people online who I relate to...and some of them know more about me than my IRL friends! I have met some and exchange emails etc with others. I consider these people my friends. But there are a lot who I may comment on their blogs and vice versa but we will always be acquaintances, just like in real life! Oooh, that's a tricky one. I DO consider a couple of bloggy buddies friends (cause we also email each other), but who knows what it would be like if I actually met them ~ ha ha! I get so nervous before meeting people for the first time but it's almost always worth it :) have fun tomorrow and can't wait until our paths cross IRL again! AH! it's like you read my mind... I swear I spend SO much time online, blogging, FB, tweeting, now DailyMile, and it's like I have no REAL life friends. But most of my "real life" friends don't understand my running/crossfit addiction and it makes for awkward interactions. I'm lucky that I do have a good group of girls that I've met through blogging and we do get together fairly regularly (though not as much I want!). I have come to count some blogger friends as real friends…and I haven't even been doing this that long! I would love to meet more bloggers in real life and am jealous of the groups of bloggers who live near each other. Sometimes I just feel like I have more in common and it's easier to understand and be understood by blogger friends than my other friends! And I think it can be harder to meet people as you get older…we moved to Arkansas 3.5 years ago and it took awhile to get a group of friends. I definitely consider my blog friends "real" friends, I hope one day to actually meet some of them but I am okay with the fact that I might not. We share so much on our blogs, it's like we really do know each other! I have a pretty close group of friends, but one thing I don't share with all of them is my love for running and fitness, only my best friend, Carla, shares that with me. So it's nice to bond with others that share the same passion. Sometimes I have to pry myself away from the computer and force myself to do real-life stuff and focus on my real-life friends! It's definitely hard to meet people the older you get. I think it's especially true when trying to find couples friends. I'm fortunate to have a few but people are starting to have kids and I wonder how that will change the relationship. love the photo with you and your "friends"! From reading your post I would say that the people's who's blog you read should be considered as friends as you are getting an insight into their lives that maybe most of their own friends don't about. I consider mine as friends.